My interest in dying wool has been developing over the past few years. I began using acid dyes and now use only natural dyes. In general, I dye well scoured fleece rather than yarns or fabrics. The reason for this is that I want fine control over the final colour of my spun yarns and this is most easily achieved by blending dyed fleece — in my case on a drum carder, though the same effect can be achieved on smaller volumes with a blending board. There is, of course, a very wide range of acid dyes so you can, for example, start with a soft pink and decide to make it just a little more yellow or red by blending yellow- or red-dyed fleece with the pink. It is also interesting to dye fleece in each of the primary colours — red, yellow and blue — and then produce various shades of green by blending yellow and blue in different proportions or various shades of magenta by blending red and blue or getting cyans by blending red and yellow. In this way you can get all of the colours of the spectrum. More complex colours involving different combinations of all three primary colours such as browns are harder to achieve. Fortunately for me, my shetland sheep produce natural browns and greys. 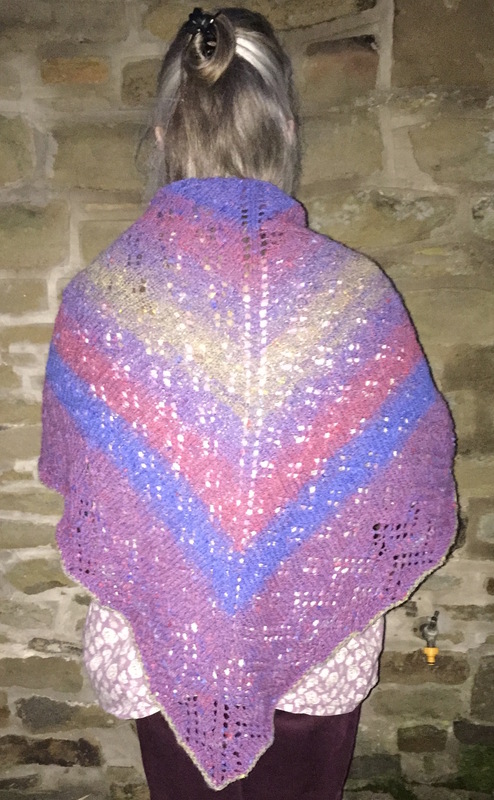 The shawl in the photo to the right was knitted by Linda from yarn spun from fleece which was acid dyed and blended entirely from the primary colours of red, blue and yellow. In order to get the different coloured stripes to be of the same width, by calculated the relative weights of yarn required for the area of each stripe. This is not perhaps as difficult as it sounds. By plotting on graph paper the width of each stripe in the triangular shawl and multiplying that width by the common stripe thickness, I came up with an area for each stripe. Summing these areas gave me a total area for the shawl and from that the proportion of the total weight required for each stripe. We already had an idea of the total weight of the shawl (400 grams) so the weight of each colour was just the proportion of the total weight as calculated from the graph paper times 400 grams. The blue and red stripes are the closest to the primary colours that I could find in acid dyes. The purple is a blend of red and plue whilst the green-yellow (the bright stripe) is a blend of yellow and blue. The yarn is plied from two singles. Each single was spun from the same weight of yarn with each stretch of colour determined as the correct (and same in both singles) proportion of half the total weight of the finished shawl. This yielded the colour-gradient yarn with some (though limited) “barber-poling” between colours.